Many people think of log cabins as cozy affairs, quaint little abodes out among the trees and the fresh air of the forest. These places would typically be far removed from the world of hauntings and ghosts, but there are a few out there that hold something sinister lurking under the veneer of peaceful solitude. Let’s take a little tour of some of the supposedly haunted log cabins that can be found lying in beautiful areas, yet which are surrounded by spooky tales and dark histories. Our first stop is a bit more than a log cabin, more like a log castle, built at the turn of the century by a man named James Alexander “Jimmy” McOuat out at White Otter Lake, in Sunset Country, Ontario beginning in 1903. It is said that McOuat singlehandedly cut all of the red pine logs and interlocked them himself to form the three story log house complete with a turret, an amazing feat considering its massive size and the fact that some of the logs weighed over 1,500 pounds, and indeed it took him a full 11 years to make. The man was reportedly a hermit and mountain man who kept to himself and rarely talked to anyone else, spending all of his time cutting, hauling, and piecing together the logs that would comprise his masterpiece. It would also be one last things he ever did, his legacy that he would leave to the world when he tragically died just a few years later after getting entangled in a fishing net while out on the lake fishing. To this day his ghost has been seen all around the log house and at the lake shore, often dripping water to leave puddles behind and still wrapped up in a fishing net. A very well-known haunted cabin also lies at Fort Worth, Texas, at a place called the Log Cabin Village. Among the various historic log cabins in the area dating from between 1843 and the 1880s the most infamous is the one called the Foster Cabin, once owned by a man named Harry Foster and his family and now the location of the village staff’s offices and the gift shop. According to the lore, Harry Foster’s wife died here in childbirth, after which he went on to marry the nanny, a woman named Jane Holt, who would also die in later years. It is Holt that is said to still remain in the cabin, and one of the biggest signs of her presence is the heavy smell of lilac perfume, which she had been rather fond of in life, which appears from nowhere and dissipates just as quickly. There are also reported mysterious roving cold spots, objects that disappear to turn up in strange places, unseen hands that nudge visitors and staff or even pull their hair, and anomalous footsteps often heard, especially emanating from the attic above the second floor. It is unknown why this ghost should be the one to remain tethered to this place, but she has become a rather popular curiosity for people visiting Log Cabin Village. Laura visited 3 times – The cottage is said to be haunted by Laura, a black lady who lived in it for 50 years. The first week was very chilly in Savannah. Laura made herself known to us on 3 visits. The first was by opening a downstairs window from the bottom up on one chilly morning. The window was locked! Soon after she flickered the lights over the dining table, and the bulbs were in nice and tight. On the coldest night of the year, you could smell wood smoldering like a campfire after water had been poured on it. It was on and off, but so strong that we checked the cottage. Laura was telling us she would keep us warm. We never saw or heard her, but she was there. In Austintown, Ohio, we come to a quaint, frontier-style cabin built in the early 1800s called the Austin Cabin, which lies along a remote narrow road meandering through the trees called Raccoon Road. The cabin itself, once owned by prominent residents Calvin and Martha Austin, long sat abandoned and feral within thick, overgrown wilderness, forgotten by the world until it was discovered in 1973 as the land was being cleared for the building of a church. Austintown’s community council and historical society then went about renovating and restoring the historic log cabin, and making it a National Historic Landmark in 1975. It is also supposedly haunted, with the most common occurrence is sightings of what is said to be a headless specter wearing period clothing from the 1800s. Adding to the list of haunted cabins is the Cressler Creek Log Cabin, near Hoxie, Kansas, which at one point served as a field hospital during the Civil War and experienced much death. It is perhaps this history infused with pain and suffering that has drawn to it the spirits of dead soldiers in bloodied Civil War uniforms, who roam the cabin and its surrounding woods at night. There is also the Corbin Cabin, located within Shenandoah National Park, and which in the early 1900s was home to a man named George T. Corbin and his wife. The wife reportedly died in childbirth here and was buried somewhere on the property, where she still appears as a glowing wraith, and the ghost of Corbin is also said to prowl the cabin and woods here. That one just stood out like a sore thumb. Because it’s a four digit, bipedal, size 13 with a hook claw in the front that’s probably three or four inches. What made this footprint? Was it a Bigfoot or something else? Another case of a haunted cabin revolves around a structure that isn’t even there anymore, having burned down in a fire long ago. The cabin supposedly once sat along the Roaring Fork Trail, part of the Great Smoky Mountain National Park, at border between Tennessee and North Carolina. There is no sign of it anymore, as it allegedly burned to the ground in 1909, along with its occupant, a young woman named Lucy. The woman’s ghost has been persistently sighed along the trial ever since in the area where he cabin once stood, always barefoot, and she is known to appear at the nearby highway and try to hitch rides as well. Whether this is urban legend or not, the tale of “Lucy at Roaring Fork” has become famous in the area, and she is one of the region’s most famous ghosts. 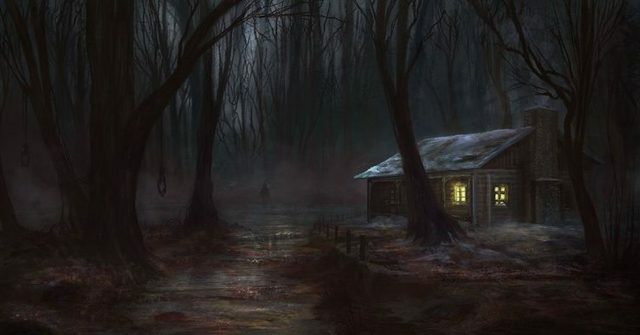 These have been just a few of the curious tales of haunted cabins in the woods, and whether they are just urban legends or in any way real they are spooky all the same. It seems that the woods and this isolated wooden structures sitting out there by themselves are perfect settings for scary stories such as these, and as long as these creepy old log cabins are around there will surely be stories of ghosts to populate them. Adding to the list of haunted cabins is the Cressler Creek Log Cabin, near Hoxie, Kansas, which at one point served as a field hospital during the Civil War and experienced much death. It is perhaps this history infused with pain and suffering that has drawn to it the spirits of dead soldiers in bloodied Civil War uniforms, who roam the cabin and its surrounding woods at night. “ghosts” from the civil war times, seems to be the most credible (IMO, these days). I vaguely like the story of “Laura”, and the guests interpretation of it as “Laura will make sure that the guests are warm” 😲🙂.